Canela Lemoine's tag-shaped silver charm reminds us that to touch our dreams, we must follow our hearts. As a kid, playing tag meant chasing a friend, giving them a little tap, and sprinting away with a sense of accomplishment. Canela Lemoine's silver necklace encourages you to keep pushing yourself forward. Now that you're grown up, and chasing bigger dreams than winning schoolyard games, this tag-shaped charm assures you that your goals are within reach. 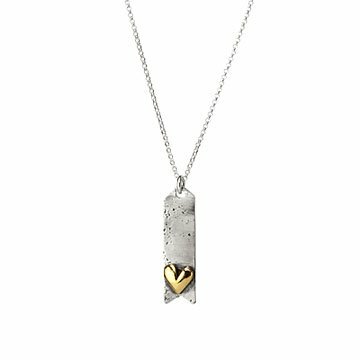 The tag reads "loved" on one side and features a raised brass heart on the other, as a reminder to follow yours. It's also a fun way to tag a loved one to let them know how much they mean to you. (Tag backs are totally allowed.) Handmade in California. 1.4" L x .4" W Chain: 18"
Loved the "tag" though the chain was cheap and short. This item was not cheap, so sell me the piece without a cheap chain. Spoiled the experience.